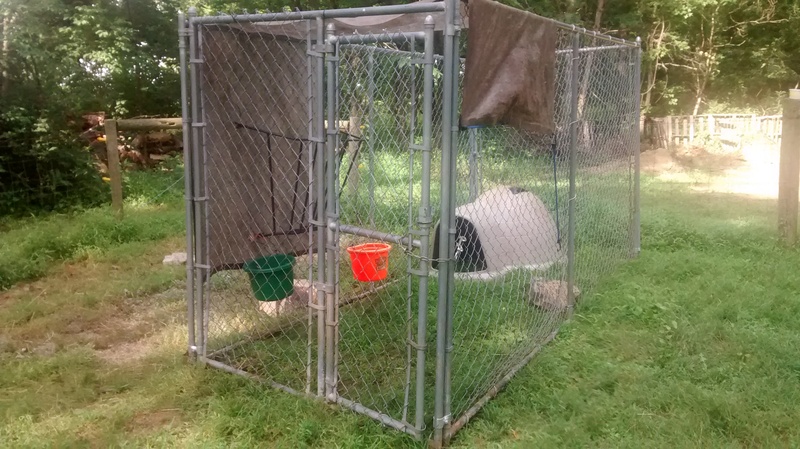 We have shown you our rotational grazing goat pen, and today I’m going to show you the setup we have for where the goats spend their time when they’re not out rotationally grazing. 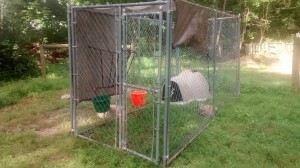 The goats came with this chain link dog run and dogloo house. It works well as a place for them to sleep, and to spend their time during inclement weather. I think it would be a little small for them if they stayed in it all the time. Inside the door to the left is the feeding and watering area. 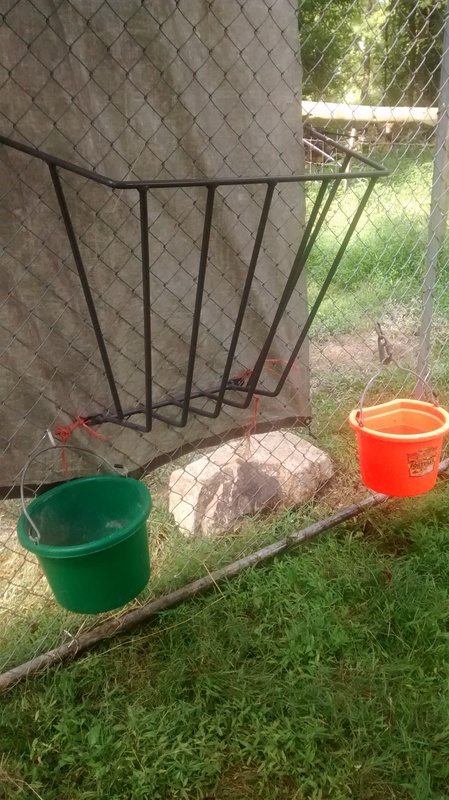 The green bucket on the left is for minerals, the hayrack is for hay, branches, or other large treats we give them, and the orange bucket on the right is for water. We clipped the buckets onto the fence high enough so the goats can’t poop in them. The tarp on the fence is to keep rain out of the mineral bucket and off hay that might be in the hay rack. Before I put it up, water would get in the mineral bucket, and the goats wouldn’t eat the minerals after they were wet, so they were ruined. 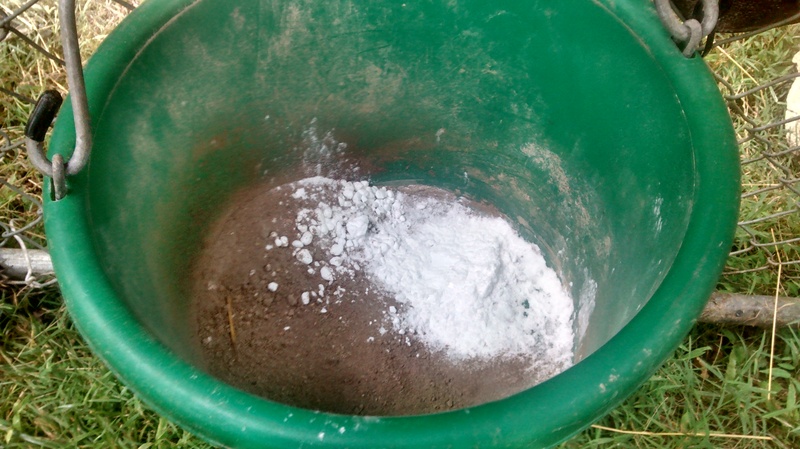 In the mineral bucket I put goat minerals mixed with diatomaceous earth(DE), and baking soda. The minerals came in a big block, and I just scrape some off to put in the bucket. Setting the entire block out seemed excessive for our two small goats, and I didn’t want it to get ruined in the elements. DE might help with worms and other internal parasites. Its efficacy is debatable, but Joel Salatin recommends it, so it must be right! Baking soda is supposed to help maintain the correct acidic balance in the goats’ digestive systems (link). I know that they love the baking soda, and eat it up. Since many goat issues have to do with the digestive system, I figure its worth it to offer the baking soda and see if it helps. The goats eat what they want or need from the bucket, and I refill it as needed. Here is the rest of the pen. The two goats go in the igloo every night. It’s fun to peek in and see them cuddled up in there! They also like walking on the rock, which we hope will help wear their hooves so they can go longer between trimmings. One of the great things about this pen is that it’s easy to move. Every week we throw the igloo over the fence, and move the chain link pen a few feet over to new ground. 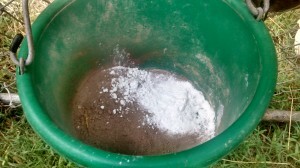 This keeps the grass from getting killed, and it should also help with worms, which are a major problem for goats in high rainfall areas like ours. Since the buckets and hay rack are on the chain link, it’s pretty quick and easy to move the whole setup. We’re only moving two things: the igloo, and the fencing. 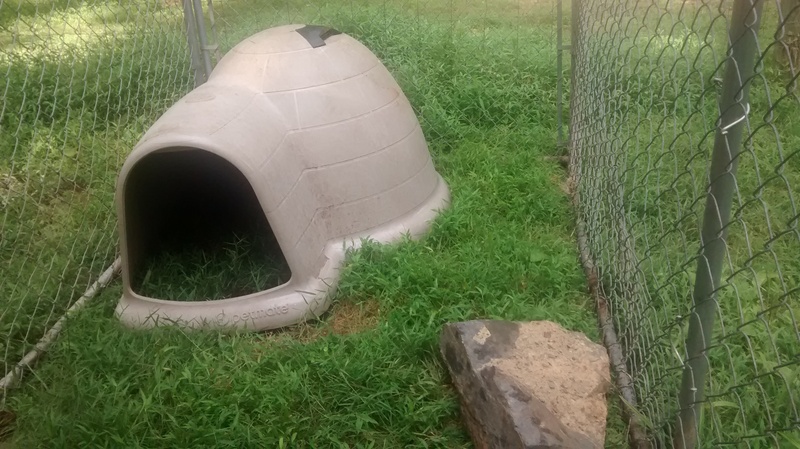 We have several rocks in this area where we rotate the pen, so we don’t move the rock as a new one will be there in the new enclosed space. The hardest part is getting the igloo over the chain link since it’s an unwieldy shape. This pen rotation is very easy with two people, but one person can do it by him or herself. 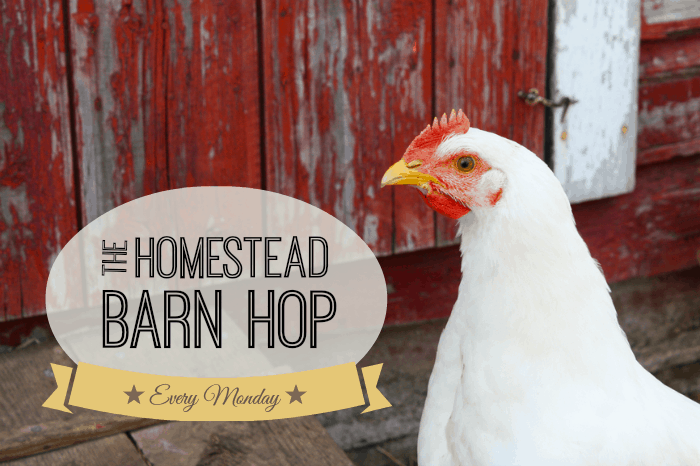 We are happy to welcome our visitors coming from this weeks Homestead Barn Hop, thanks for checking out our page!